On 23rd February 2009 a Mass and Wreath laying ceremony remembered the 75th anniversary of the burial of Edward Elgar O.M. "As we gather this morning to commemorate the 75th anniversary of the death of one of England's great composers, on behalf of Fr Christopher, our parish priest, and all our parishioners may I welcome you to our church on this nice spring morning, The weather today is very different from what it was 75 years ago at Elgar's funeral. We are pleased to have with us some of the great nephews and nieces of Sir Edward, who have been, and still are, good supporters of this church. I am also pleased to welcome Serena Croad, the Leader of the District Council, a large contingent from the local branch of the Elgar Society, representatives from the English String Orchestra and their friends, and Mrs Berington of Little Malvern Court and our sister Parish of Little Malvern priory. It was the Beringtons who kindly made available the land on which this church and our cemetery now stand. In addition to those I have mentioned, I welcome you all. 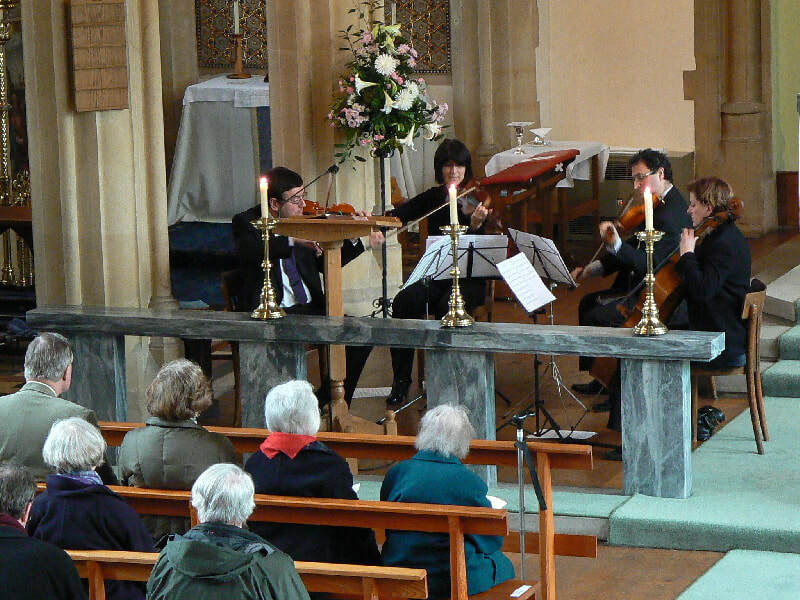 The Friends of the English String Orchestra kindly sponsored the String Quartet under the leadership of George Ewart which we have just heard and who will play again towards the end of our service. I hope those from the ESO and the Friends will convey our thanks back to their committees. Lastly, before we commence our service we thought it would be appropriate to reflect on the events of 75 years ago. I am indebted to Nicholas Ratcliff for his research and providing me with much useful information. What is very clear is that Elgar wanted a very private, no fuss funeral. This was respected, with only a few attending. Elgar had originally wanted to be cremated and his ashes to be scattered at the confluence of the Rivers Severn and Teme. However his daughter, Carice, persuaded him that he should be buried in the same grave as his wife. Elgar himself wrote, in a very shaky hand, what was to be added to his wife's tombstone, namely, "And in memory of the above named Edward Elgar died (and the date)". Following the expressed wish of Sir Edward Elgar that his funeral should be strictly private, no intimation of the time was given, but on Monday the following official announcement was made: "The funeral of Sir Edward Elgar took place quite privately at 10 o'clock this morning at St Wulstan's church, Little Malvern." "Almost before the morning mists had cleared away over the Malvern Hills, which he loved so well, Sir Edward Elgar was laid to rest on Monday. He lies by the side of Lady Elgar, his beloved partner in life who died 14 years ago. The great musician went to his rest without a note of music being played. In the Catholic Church of St Wulstan's Little Malvern; a brief simple service was conducted by the Reverend GC Alston. Scarcely a score of people were present, and in fact only a few intimate friends knew of the time and place of the service. There was no mourning dress or "formal attire". The priest in robes of black and gold, had three attendants, and lighted candles threw a soft glow over the purple covered coffin. In a few minutes the congregation passed out into the little churchyard with the sunlit valley of the Severnspreading away below and the Malvern Hills rising steep behind. The smoke of incense rose on the clear morning air. There was a sprinkling of holy water and in a few minutes the little group of mourners left the grave. Sir Edward had been placed to rest. As the mourners dispersed the sky darkened and flakes of snow came drifting over falling gently on the plain oak coffin." The Black Cope, which Fr Christopher will wear as we go to the Graveside, is, we believe, the one worn by the Priest at Elgar's funeral. "In the recent splendid book on Madresfield, I was surprised to read that Elgar was cremated and his ashes scattered in the waters of the Severn. As the indignant incumbent (although that is not how I signed my letter) I wrote to correct this error and was assured in reply that it would be corrected in the paperback version. In return I do recommend you buy the paperback, because it is an excellent read. Judging by the regular flow of visitors to our cemetery, many people are better informed about Elgar’s burial place than the author of Madresfield. 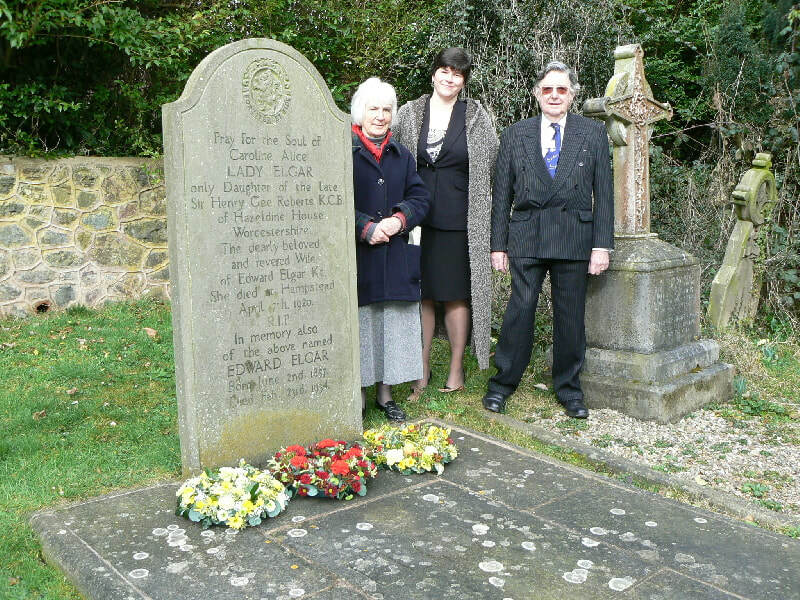 We are grateful to the Elgar Society for their help in maintaining the grave, and to Mrs Jill Bradshaw and Dr Geoffrey Bradshaw for their personal time and attention to it. The late Jean Aitken, who died last year, left us a generous bequest for the maintenance of the cemetery. However we will not be putting up the sign someone saw recently in a cemetery saying. We are working to make our cemetery a safer place. Visitors to the church sometimes ask us ‘Did Elgar worship here?’. I suppose the honest answer is ‘Not much.’ Or at least not in the ordinary way of worship. Apart from other considerations, the Elgars had moved about a good deal. Then too, like any great artist, Elgar had his share of the groaning of the spirit of which St Paul speaks in our first reading. The ways of coming to faith are almost infinite. We all grapple with our understanding so as to find the answers our hearts look for. The more our hearts have an inkling that there are indeed answers - or one might say in those moments in life when we perceive there must be an answer - the harder the grappling and the greater the groaning. There is a parallel in our faculty of sight. We cannot see the micro-world of atoms, nor beyond the horizon, we certainly cannot see more than the mere shining of the moon and the stars. And so we have devised microscopes and telescopes to aid our vision, at least partially. Art - and music - are full of the promise of what lies beyond our ken, and on occasion they may act like the optical aids which show us a little more of the mystery of being. But they always leave us looking for more and for the greater truth. The words of Christ in our gospel reading are reassuring in our grappling with faith: the will of him who sent me is that I should lose nothing of all that he has given to me. ‘All that has been given to me’, means us: we who have been brought to him by our tradition, scripture, and church. ‘Whoever sees the Son and believes in him’ is our inkling and vision, still in a glass darkly, but one day face to face. As St John says elsewhere: for then we shall be like him, because we will see him as he really is." Before the Mass a selection of his pieces was played by the ESO String Quartet. Fr. 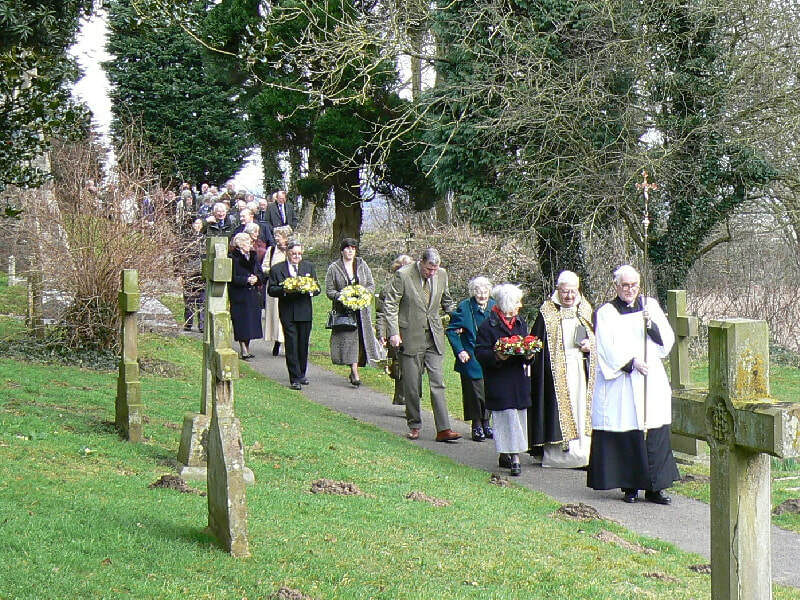 Christopher, members of the Elgar family and the congregation process through the churchyard to the graveside. Wreaths were laid by: Miss Hilary Elgar (left) on behalf of the family and the church, by Mrs Serena Croad, the leader of the MHDC on behalf of all in the Malvern District, and by Dr John Harcup on behalf of the Elgar Society.